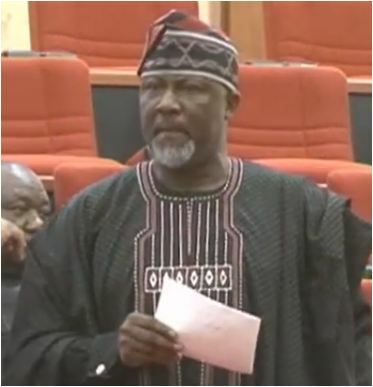 The Nigerian Immigration Service, NIS, has explained why Senator Dino Melaye representing Kogi West was on Monday morning arrested at the Nnamdi Azikiwe International Airport, Abuja. Spokesman of the Service, Mr Sunday James told the News Agency of Nigeria that Melaye was arrested by Immigration officials “based on instructions”. The confirmation came hours after the senator, who represents Kogi West at the upper legislative chamber, announced the arrest on his Twitter handle at 7:32am. “I have just been arrested at the international wing of the Nnamdi Azikiwe International Airport on my way to Morocco for an official engagement sponsored by the Federal Government after checking in,” he tweeted. The police recently declared Melaye wanted after he was accused of supplying arms to some murder suspects, who allegedly implicated him. The senator, however, denied the allegations.